Today we got our first good look at Game of Thrones’ seventh season, and boy howdy does it look like we’re in for some dark times ahead. But while the trailer is suitably cryptic, if you’ve been paying close attention to the rumors surrounding this penultimate season, it paints an intriguing picture of the battles coming to Westeros. 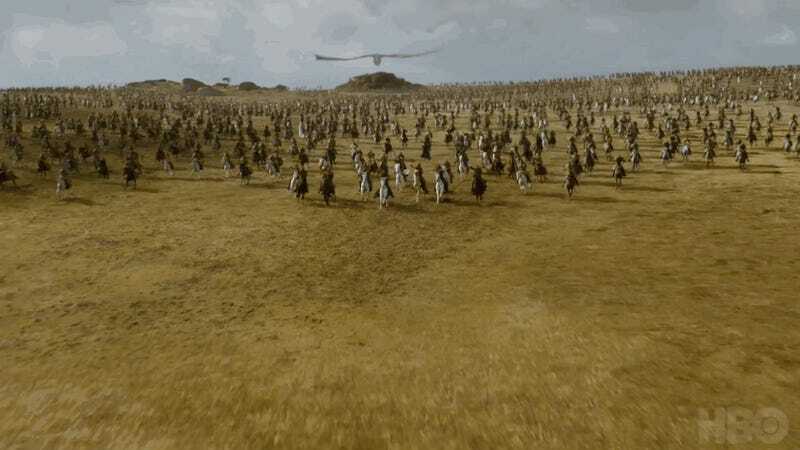 “Enemies to the East” is represented by Grey Worm (Jacob Anderson), and a legion of Unsullied behind him. “Enemies to the West” is this Greyjoy ship. Pause at just the right moment and you can see their Kraken sigil on the sail—presumably this is from Yara and Theon’s fleet of boats that sailed to Dany’s side in the last season. “Enemies to the South” offers us a cryptic shot of someone cleaning a blade. We’re not sure who this is meant to be, the lighting of the scene and the clothes the wielder is wearing makes us think that this could be Arya, cleaning her dagger after slitting Walder Frey’s throat last season. The outfit and general shape matches, but it’s too dark in the scene of Walder’s death to make out to see if the indentation shown here is on it. Also, that theory seems to clash with the fact that Cersei’s declaration of “enemies to the North” shows us Arya (Maisie Williams), trotting along a wintry path alone. It’s interesting to note it’s Arya shown here, and not Sansa (Sophie Turner) or Jon (Kit Harington). Why show Arya both times if she’s the one holding the knife, too? “Whatever stands in our way, we will defeat it,” Cersei declares to her brother Jamie (Nikolaj Coster-Waldau). The two are overlooking a gigantic map of Westeros, and Cersei in particular is standing pretty much right over where the Twins—the ancestral home of the Freys— would be, in the Northern Riverlands, as she looks toward Winterfell. 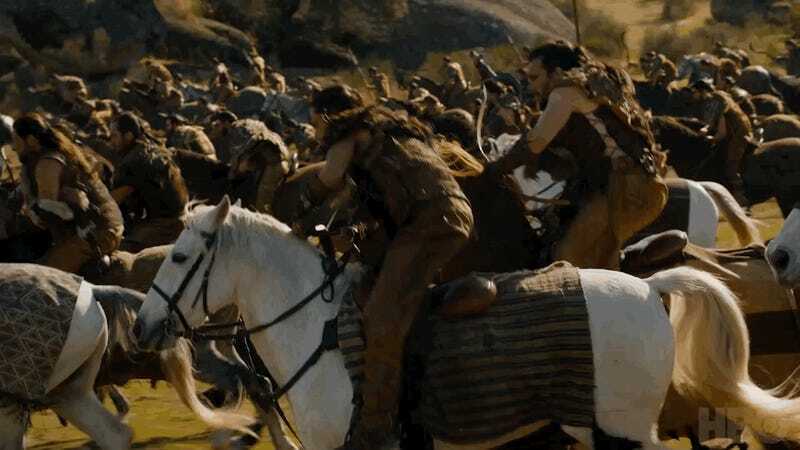 We have heard a lot about a major between Daenarys (Emilia Clarke) and Lannister forces at some point early on in the season—where the Dothraki attack a convoy of Lannister soldiers returning from a siege of Highgarden, so this seems to be the mustering related to that. “We’re the last Lannisters. 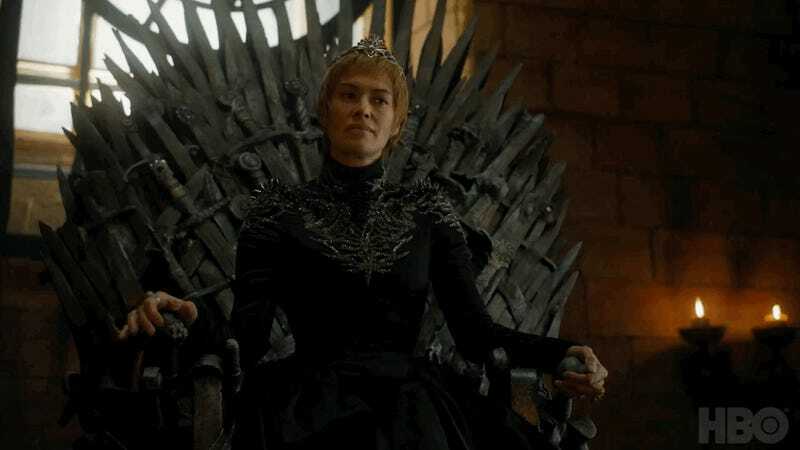 The last ones who count.” says Cersei, with Jaime shown by her side as she sits on the Iron Throne. The sneer on her face is everything. 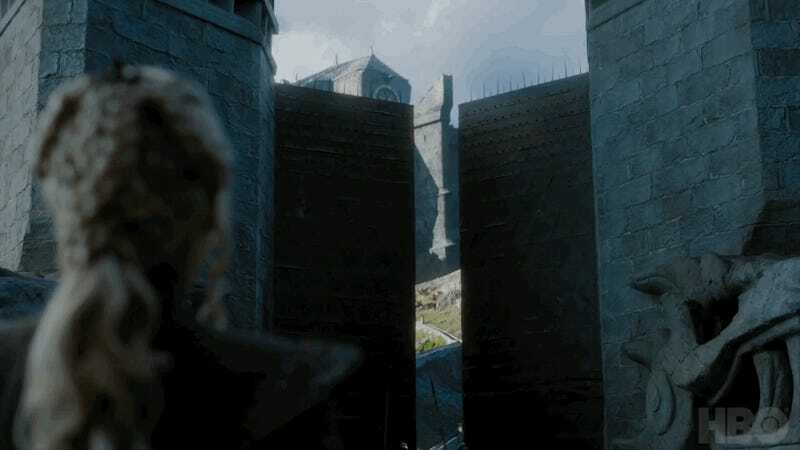 ... Daenerys, solemnly watching as the gates to Dragonstone (once Stannis’ seat of rule, and before that, one of the last bastions of the Targaryen family on Westeros during Robert’s Rebellion) open before her. We’ve heard that Dany takes the castle for herself pretty early on in the season, using it as a place to strike out at the Iron Throne from and meet with some pretty major allies, who we’ll get hints of later on in the trailer. And now Daenerys takes over the voiceover with, “I was born to rule the Seven Kingdoms. And I will.” We’ve seen a wider shot of this moment here in the first pictures from the season, revealing that Dany is joined for the moment by Varys (Conleth Hill), Missandei (Nathalie Emmanuel), and Tyrion. She’s naturally very emotional to be back—after all, Dragonstone is where she was born, and last saw it as a very, very young child. Dany takes her place on Dragonstone’s extremely rad throne, which is new for season seven. We previously saw it in the first brief promo for this season, however. 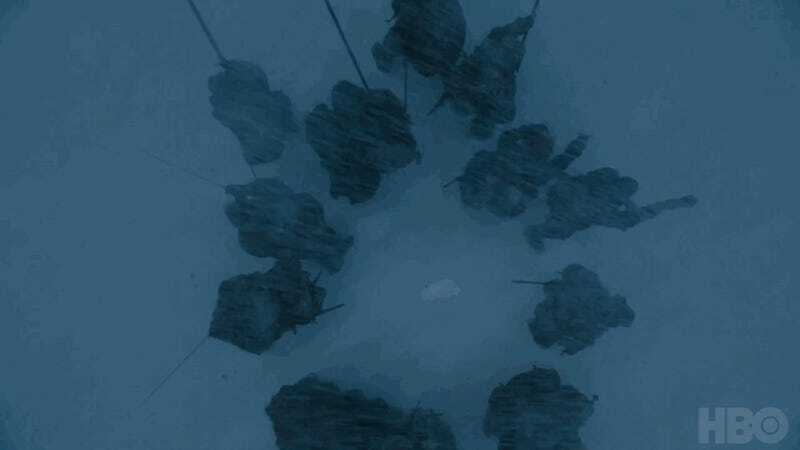 The Unsullied pouring into a courtyard under that Lannister symbol bodes poorly for Cersei and Jaime. It’s hard to tell where this is actually meant to be. 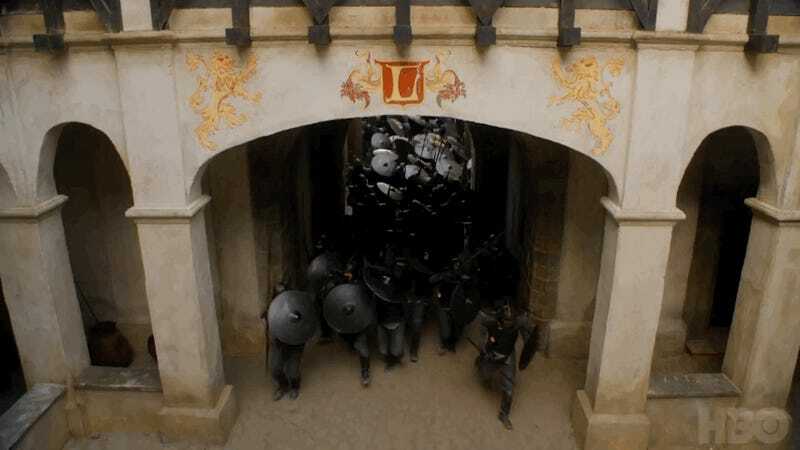 We know there’s a huge fight in store between the Lannisters and Dany’s forces, but as far as we know that takes place around Highgarden, which wouldn’t exactly have Lannister livery flying around... or, well, it apparently will after the Lannisters invade, but would they have really got round to painting lions on the gateways before Dany attacks? We do know however that the location being used for Highgarden this season, Trujillo Castle, is also being used for scenes at both the seat of the Tyrells and Casterly Rock, the famous seat of House Lannister. It’d be a bit of a stretch considering how far way it is, but could Dany’s forces be striking at the heart of Lannister territory? Basically, this trailer starts by going through every possible contender in the War for Westeros. It’s interesting that Cersei and Dany speak for themselves, but Jon’s entrance in this trailer isn’t heralded by himself, but everyone else yelling, “The King in the North.” Say hi to Brienne (Gwendoline Christie) and Sansa in background here. 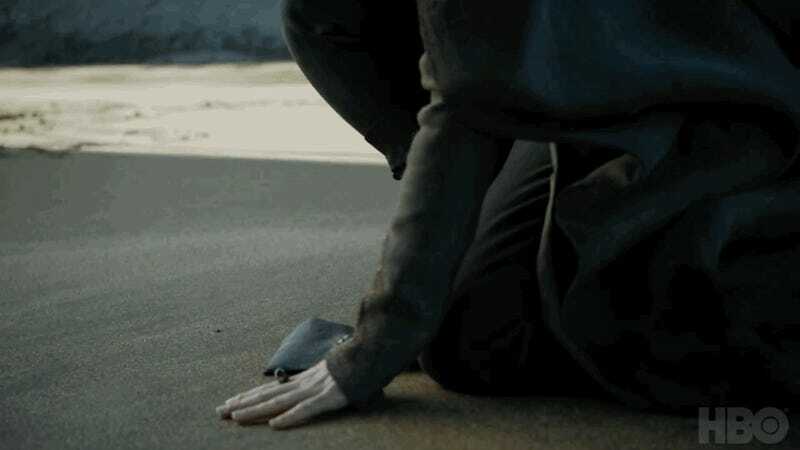 “Your father and brothers are gone, yet here you stand. The last best hope against the coming storm,” says Littlefinger (Aidan Gillen). Sansa also doesn’t introduce herself, but it makes sense to have Littlefinger speak for her, given his long-running attempts to influence her. Gate opening to ice, Theon in fire (Alfie Allen). Get it? We last saw Theon traveling toward Dany with his sister Yara (Gemma Whelan). If they meet up with her before, then this conflagration could be the aftermath of the dragons participating in a fight. 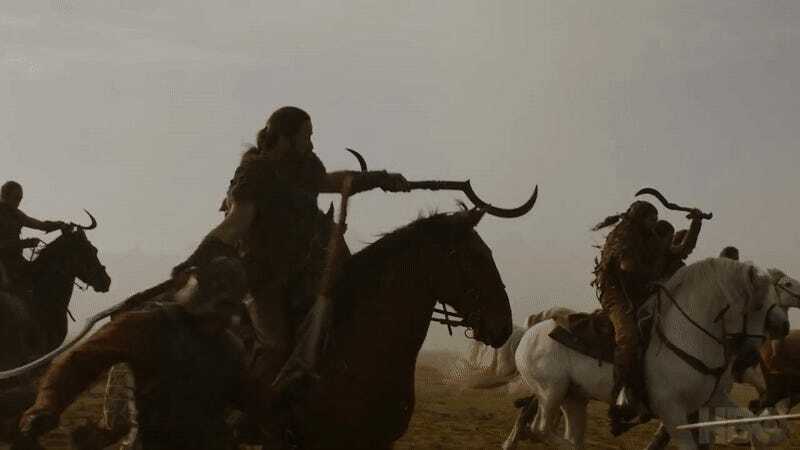 Initially, the rumors surrounding the massive battle between Dany’s army and the Lannister convoy described it as a battle with both land and sea elements—and Euron Greyjoy (Pilou Asbæk), now working with Cersei, would capture one of the Grejoy siblings. We see confirmation of that a bit later in the trailer, but if Theon’s in the fire—and because of something we see later—then it’s probably Yara who’s gone, which would match up with set pictures of her and some of the Sand Snakes being marched through King’s Landing in chains by Euron. 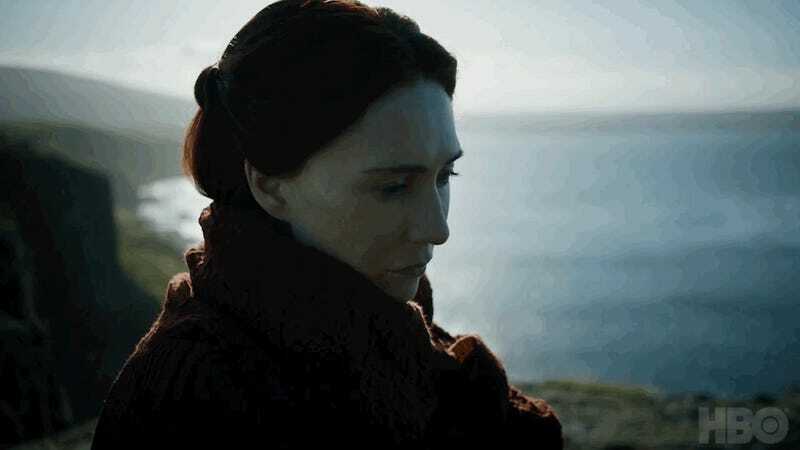 Melisandre (Carice van Houten) has traveled to Dragonstone just to watch Jon meet up with Dany—the long, winding bridge matches up with set videos we saw last year of the momentous meeting between the two. Assuming she’s still decided that Jon is the person in her prophecies (granted, she has changed her mind on that one a lot so far), she’ll probably keep following him no matter what he tells her to do. Wildings running. 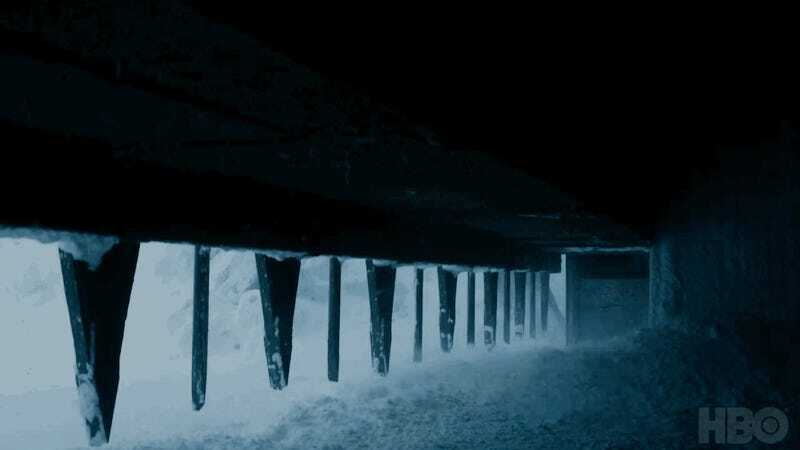 Even though we’ve been promised winter this season, this trailer is very light on Walkers... but odds are these Wildings are probably running from some, given that they’re beyond the Wall. Arya stars in Westeros’ adaptation of Jack London’s classic story “To Build a Fire.” Although there’s been rumors of a big meetup between the surviving Stark kids—not just Arya, but even Bran too—this season, this trailer sticks to showing Arya on her own, even as she seemingly goes further and further northward, and closer to Winterfell. There’s even been rumors that Arya would be reunited with her direwolf Nymeria on her travels after years of separation, which we could be seeing a tease of in these lonesome shots of her. “If we don’t put aside our enmities and band together we will die,” says Davos (Liam Cunningham), suggesting some discord in Jon’s ranks. Or could he be talking to Daenerys and her cohorts as part of the two faction’s meeting at Dragonstone? 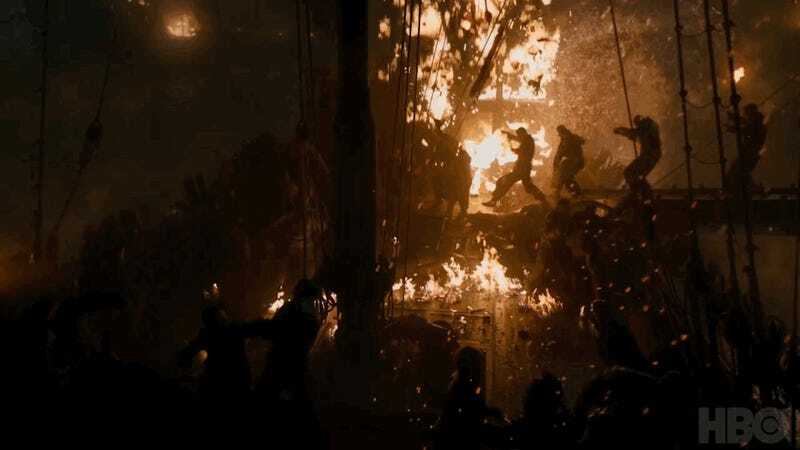 This scene of fighting Dothrakis, leaping at Lannister soldiers, is paired with this scene of battle on ships. It’s not quite confirmation of a land and sea battle taking place at the same time, since they’re clearly at different times of day. But it could be different legs of a really long fight. 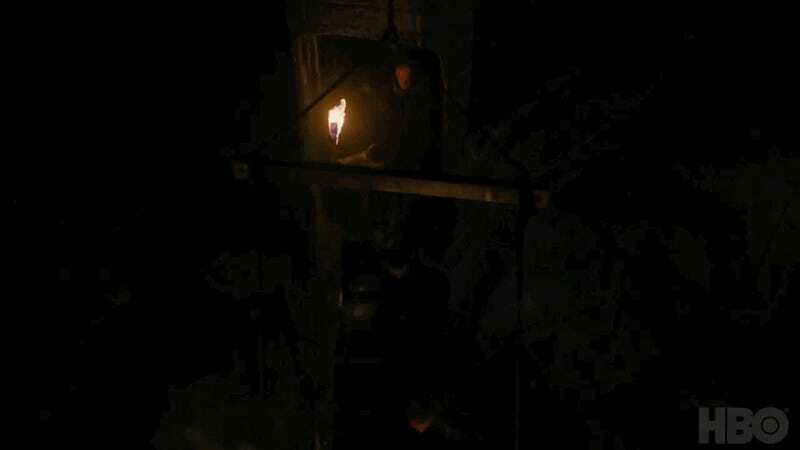 This, however, looks very much like it’s the precursor to Theon alone in the sparks we saw earlier. “Then it doesn’t matter whose skeleton sits on the Iron Throne,” Davos finishes. I’m fairly certain he’s telling all of them to stop fighting each other and worry about the Walkers. That should appeal to Tyrion’s practicality (assuming this isn’t edited to deceive and Davos is talking to them), but Dany’s been a bit more fanatical in her desires. But Davos’ dialogue here could also be a hint of an incredibly important moment in the series that’s been rumored for months and months, which we don’t get a hint of anywhere else in this trailer: a huge meeting between pretty much the entire principal cast of Game of Thrones at the Dragonpit, the former stable for the Targaryen dragons just outside of King’s Landing. This monumental meeting, featuring Cersei, Jamie, Jon, Dany, and many, many more characters apparently culminates with a White Walker being displayed to the group to emphasise the real threat facing Westeros. Davos’ threat of “ it doesn’t matter whose skeleton sits on the Iron Throne” could be dialogue referring to that, if it’s not just said during Dany and Jon’s Dragonstone meeting. It’s hard to tell just who this mysterious armored soldier is meant to be, but the design of the helmet seems to heavily imply that this is Ser Robert Strong, just with a bleak-looking new set of threads. 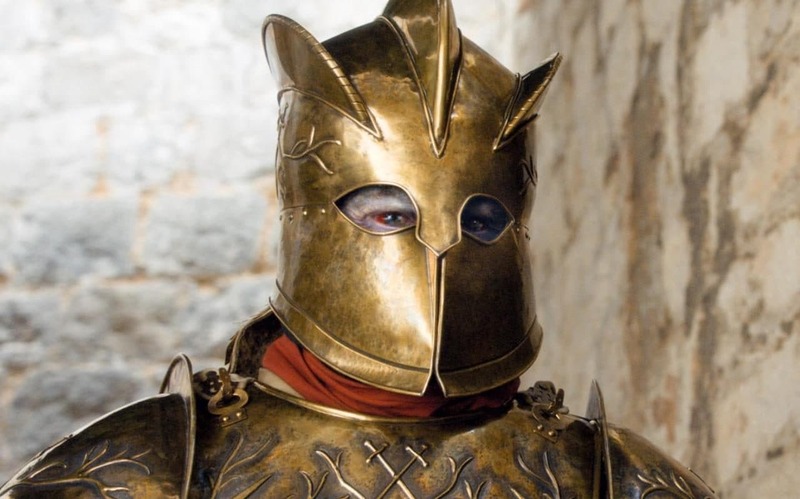 The three ridges on his helmet at least match the ones from his old golden armor. There’s something swirling in the water below as these people run around. This could be another scene on a boat related to the shots we saw earlier, but it’s so dark it’s hard to tell. 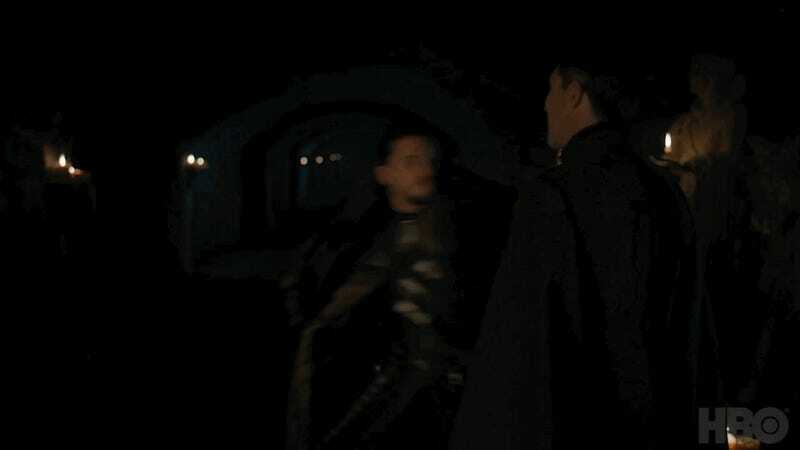 Now, this definitely looks to be taking place in tombs below Winterfell. And there are also so many reasons Jon could decide to hold Littlefinger up by his neck. Maybe he wants him as far away from his sister as possible? 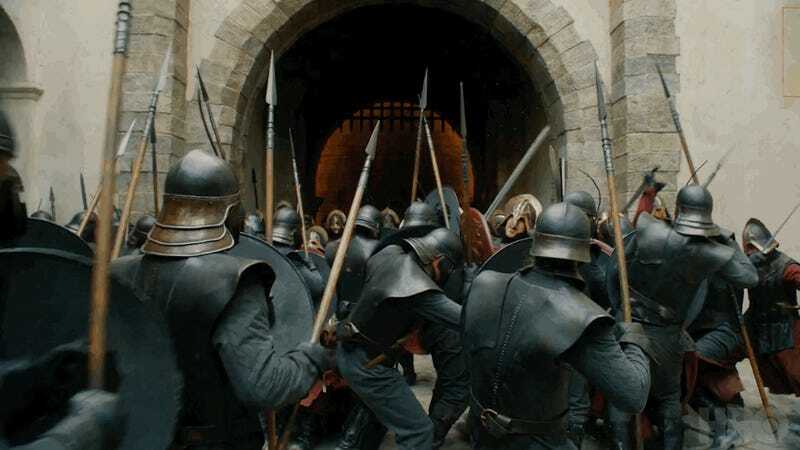 Now we know for certain that the shot of the Lannister army earlier was part of this battle, as they clash with the Unsullied. Assuming this is all one big battle—and with the truncated season order, it could be that we only get one—then there are the Dothraki on the plains/beach, the Unsullied inside what might be Highgarden or even Casterly Rock, and Yara and Theon on the sea. I mean, we did hear this battle was basically the “Battle of the Bastards” of this season, and a three-front engagement sure fits that description. The implication is that these two scenes of Arya looking under a bed and a strange arm reaching out are linked, but it doesn’t seem like that’s the case. Also, that arm is super messed up. It looks an awful lot like the arm of a Stone Man, aka people seriously afflicted with Greyscale. Could it even be Jorah (Iain Glen, otherwise not seen in this trailer), slowly succumbing to the disease himself? 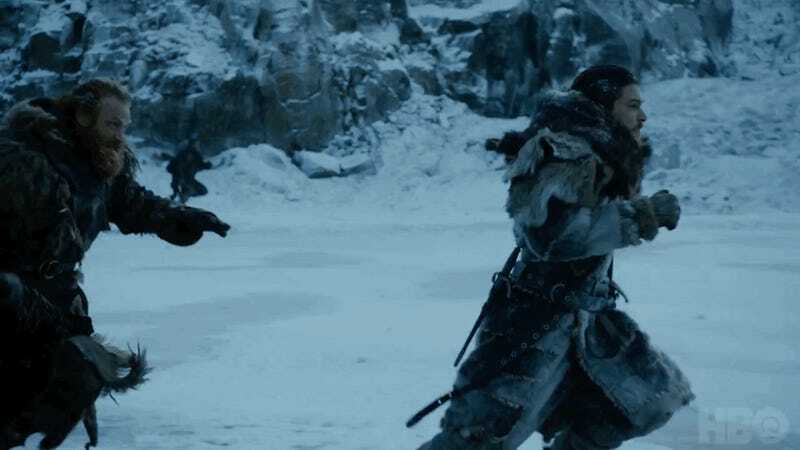 Jon and Tormund Giantsbane (Kristofer Hivju) flee from an unseen terror in the snows beyond the Wall, again one of the few shots of something bad happening up there. 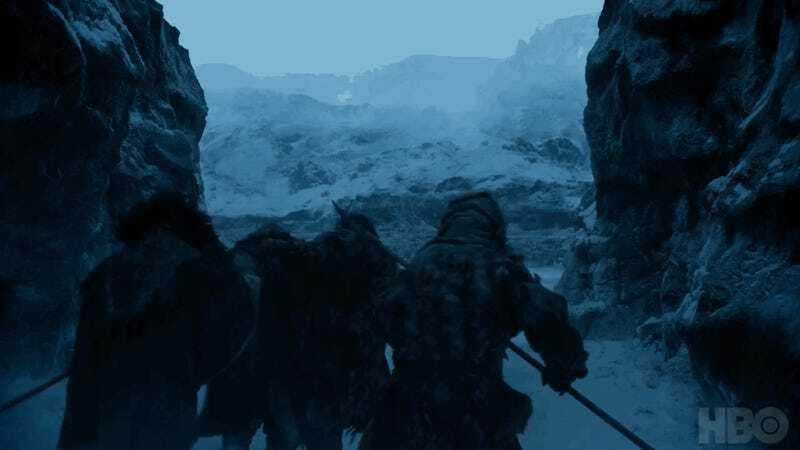 And not a single White Walker to be seen, but what makes Jon Snow and some Wildlings peg it as quickly as they can beyond the wall, if not for White Walkers? Missandei and Greyworm get it on. I mean, it wouldn’t be Game of Thrones without a little action beneath the sheets, would it? Speaking of getting it on, it looks like Yara and Ellaria Sand (Indira Varma) are going to get intimate too. These two characters being together might seem a bit surprising at first, aside from the mandatory Game of Thrones sexiness of it all, but given we know that both Yara and Ellaria are captured by Euron at some point—as well as Tyene Sand, indicating that the Sand Snakes Euron is rumored to kill this season are Nymeria and Obara—it seems like that will be the setup before we get to the kissing stuff. This is, of course, the money shot from the major battle seen throughout the trailer, and also related to the image we saw yesterday of Dany and Drogon, heralded many months ago by rumors that Dany herself would wade into the fray atop her dragon of choice. The backgrounds match, this just appears to be before the fire starts. “The Great War is here,” says Jon, ending the trailer. We’re betting it’s more like the Great War is starting, with it actually being here in the last season. 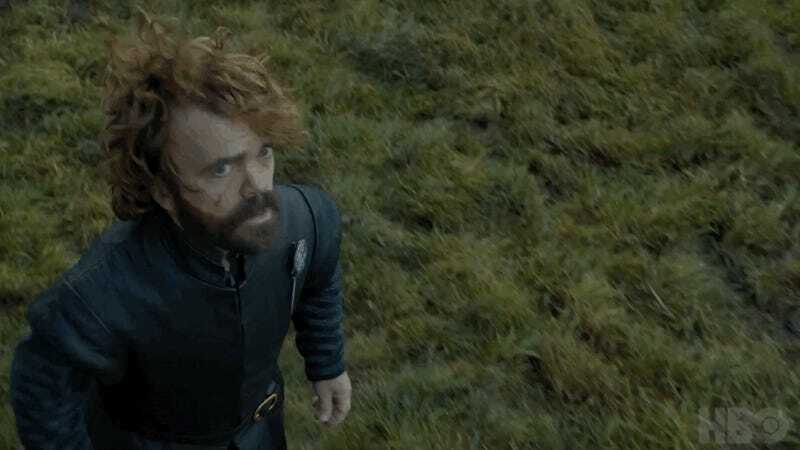 But at least it won’t be much longer until we see the beginning of Game of Thrones massive endgame: season 7 begins on HBO July 16.